I’m a convert to the comfort of a good leather saddle for longer distance bike rides. The look and durability of a nice leather saddle is a plus, as well. I’ve been riding the Brooks B17 saddles since 2008, and have ridden up to 200km on one. At that distance, I was not too sore post-ride, but I definitely had a bit of numbness for a few days. The only other issue with the B17 is that you have some minor maintenance to attend to if you want the saddle to last. 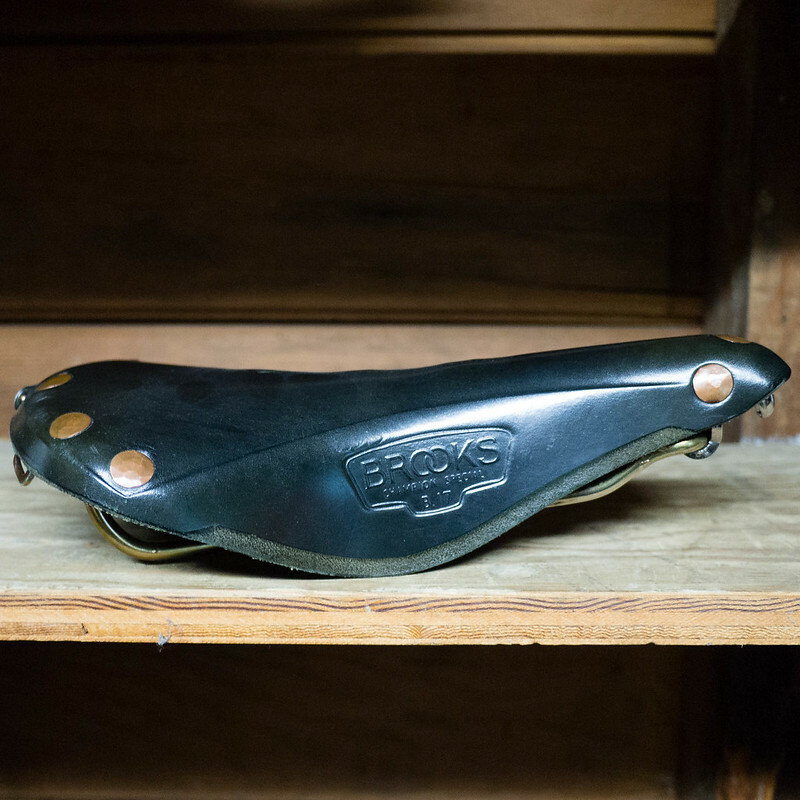 It is not waterproof, so a cover, and regular application of a leather treatment (Brooks Proofide, or Obenauf’s) is recommended to keep a saddle in good shape. 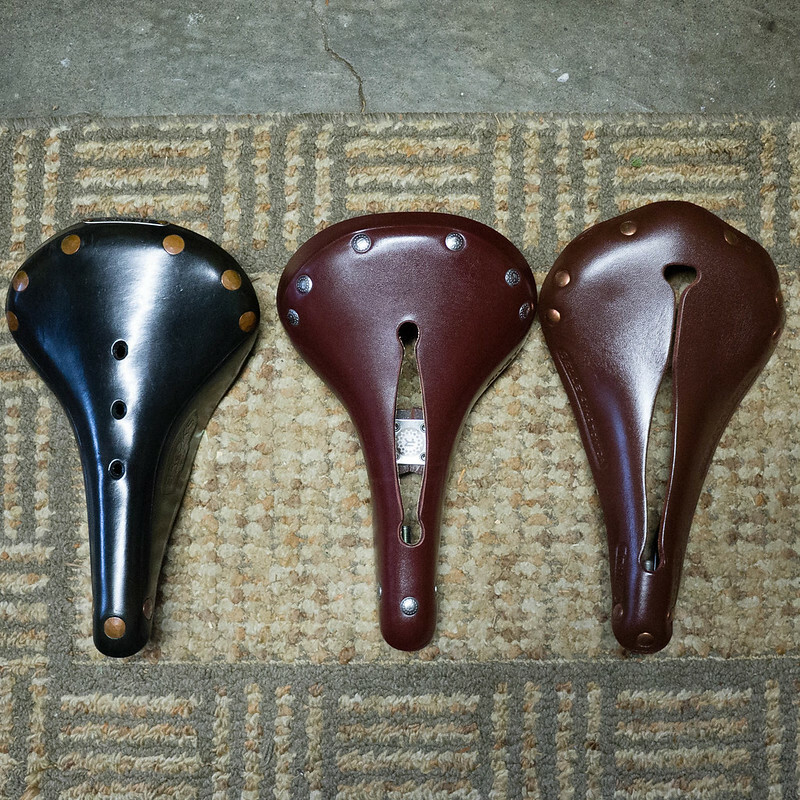 I was rebuilding a bike for a friend, and he wanted to try a leather saddle, so I bought a couple of Selle Anatomica (SA) Titanicos. I figured he would be less inclined to baby the saddle, and they advertise a “water resistant” leather. The current thoughts on the SA saddles is that they don’t hold up well to clydesdales (folks on the positive side of 200 lbs). I’ve even read that they tend to stretch out quite a bit for folks in the 180 lb range, and often end up with maxed out tensioning screws within a year. In looking for a good color match for the kidney and gray scheme on my Hunqapillar, I also wanted to add a Rivet Pearl saddle to the mix. This is a new saddle maker that uses US leather and design, and builds the saddles in Taiwan. The owner/founder is a well known randonneuse named Debra Banks who had worked for Selle Anatomica. 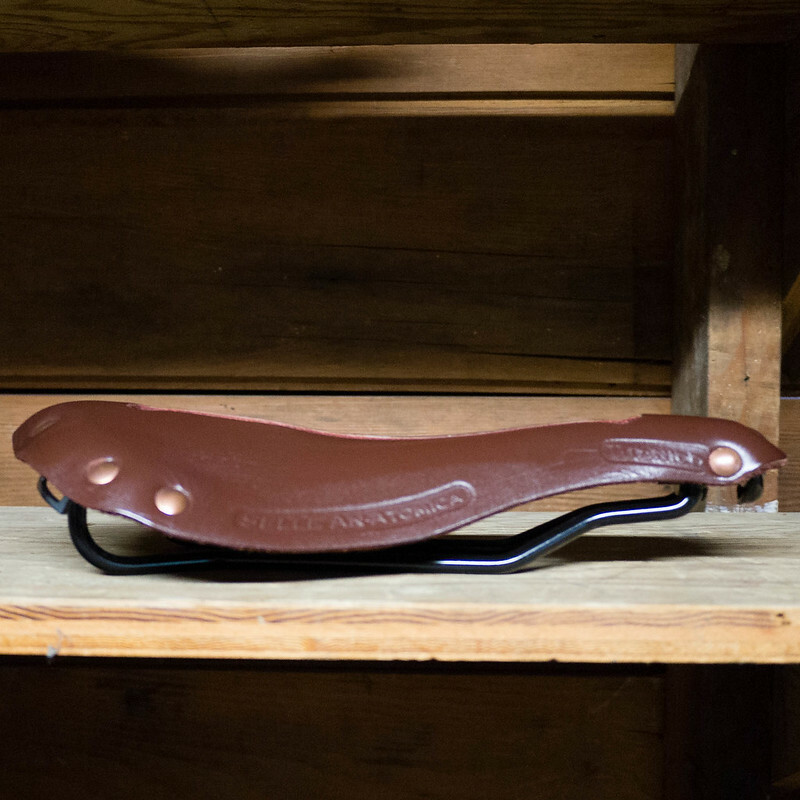 This saddle has a cutout like the SA, but is built with thicker leather to firm it up. As a distance rider runs this company, I am hopeful it is designed to provide long distance comfort, and initial reports are that it does. In measuring the setback, I did some rough measurement of the front-most point on the rails to the front of the saddle. The SA had the most adjustability and measured only 10cm from the front of the saddle to the front-most point of mounting on the rail. The Rivet had the second most amount of setback with a measurement of 12cm from the front of the saddle. The venerable B17 was at 14cm. You can see this clearly in the photo above. 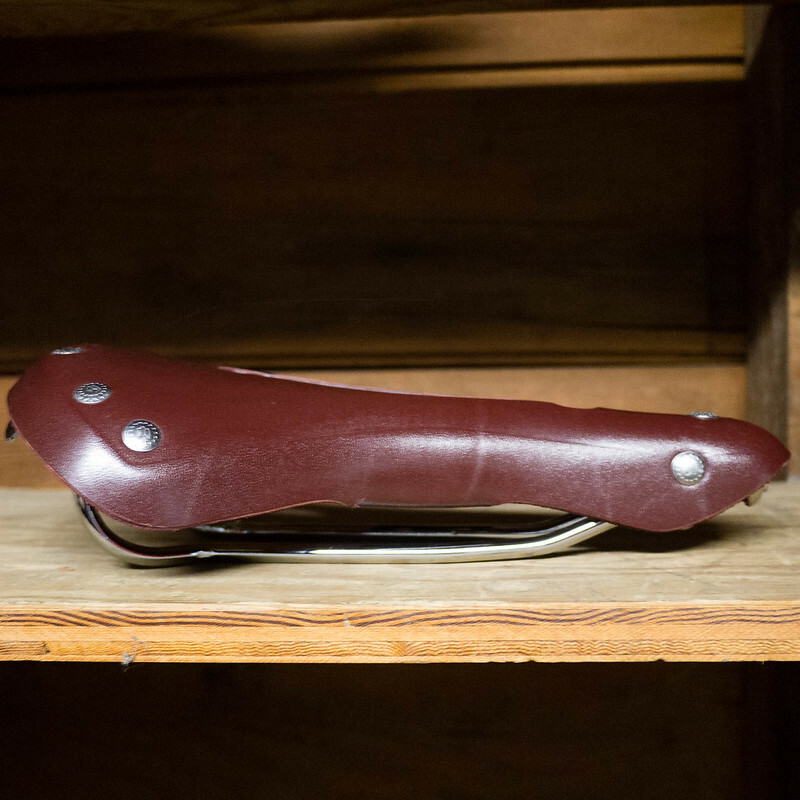 The Selle Anatomica is immediately comfortable and tends to disappear from thought. It is more finicky to line up for proper comfort – the angle has to be right. It is very much like a stretchy hammock, and has a lot of movement or “give” while riding. I’ve already tensioned the saddle after about 200 miles of commute use, and have the tension screw halfway out. The bag loops in the back are close to being unusable as they line up with, and have interference from the saddle rails. Getting a bag on it is doable, but could be a lot simpler with a small adjustment in where they line up. The finish of the saddle is a bit rough at the edges. I also notice the front of the saddle twisting slightly when I lift the bike by the seat. It is not a problem, but it seems a bit odd if you are used to seats being one-piece immobile affairs. The rails have the longest adjustability of the three saddles, and I can move the saddle back farther on the post than the other two saddles. The Rivet saddle is very firm. It is not a hammock like the SA – much more like a firm Brooks saddle. 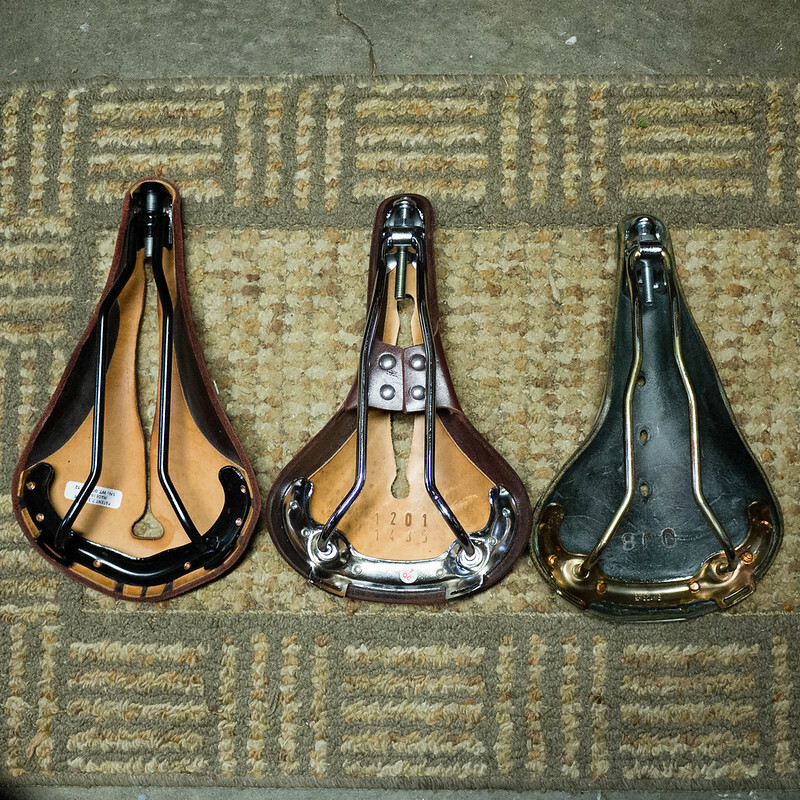 The finish is beautiful – better than the SA saddle. It is more in the realm of Brooks quality, although I still think the Brooks is tops in this category. More “classic” anyway. I have not ridden the Rivet more than a few miles so I can’t comment on break-in feel. I will have to report back on that after a few hundred kms. I have installed the Rivet on my Hunqapillar which will become my daily commuter, as well as camp/tour bike. The SA is now on my Hilsen which will do primary duty on brevets for the immediate future. It is still the most comfortable of the three, and I have no problem with it on my 18-mile round trip commute in plain old pants or short (no padding). I’ve got a pair of B17s sitting on the shelf in semi-retirement. If the SA gives out, or the Rivet doesn’t break-in, they will go back on the bikes. They are my benchmarks. I may have one of them “slotted” by SA if I feel compelled. The Rivet has had a few more rides on hot days with no padding. Hard as a rock, still. It’s bruise-worthy at first, so I may start wearing a pad for the next few rides, but I want to give it more time. It seems to disappear beneath me, so I know the angle is perfect.